We are Emil and Karen Liko and here’s our story! For many years, we felt a calling from the Lord to be in full-time ministry. During the first four years of our marriage, we led a singles ministry, an outreach and compassion ministry, and various home groups. Karen held staff positions of church office manager and church administrator and Emil was an associate pastor and a co-pastor. Then one day in October 2001, Emil heard, “Sell your car and buy a motorcycle.” We sought God earnestly in prayer for confirmation of this direction. By the end of two months, the Lord had clearly confirmed it and we had sold Emil’s car and purchased our first motorcycle, a Honda Shadow 750. Within a week of the purchase, a friend felt strongly compelled to give us an application to CMA, Christian Motorcyclists Association. We attended our first CMA meeting January 5, 2002 and came away committed to evangelism. We soon traded in our Honda for a longer-distance bike, a Kawasaki Vulcan Classic 1500. 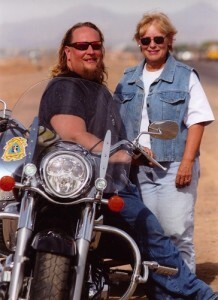 By May 2002, Emil was voted in as Chaplain of the Desert Disciples CMA chapter in Mesa, AZ. During all this time, the Lord continued to show us that this was the harvest field to which He had called us. He threw the doors open to us in miraculous ways. Using our past experiences in ministry and our hearts’ passion for evangelizing the lost, we realized that God was customizing a ministry for us. In obedience to the Lord’s prompting, we went on a one-week camping trip to Colorado in June of 2003 with no other goal than to be in His presence without distraction. During that week, the Lord laid before us a full-time ministry plan. We came home and laid this plan before our pastors and they confirmed the plan and the timing. We continued our ministry with CMA and extended the “stakes of our tent” to include a new ministry which we felt the Lord named “Bikers with Boundaries,” a ministry beyond the boundaries of the four walls of the church. God called us to this mission field, offering FREE PRAYER on the roadside . If I be lifted up… I will draw all men to me.